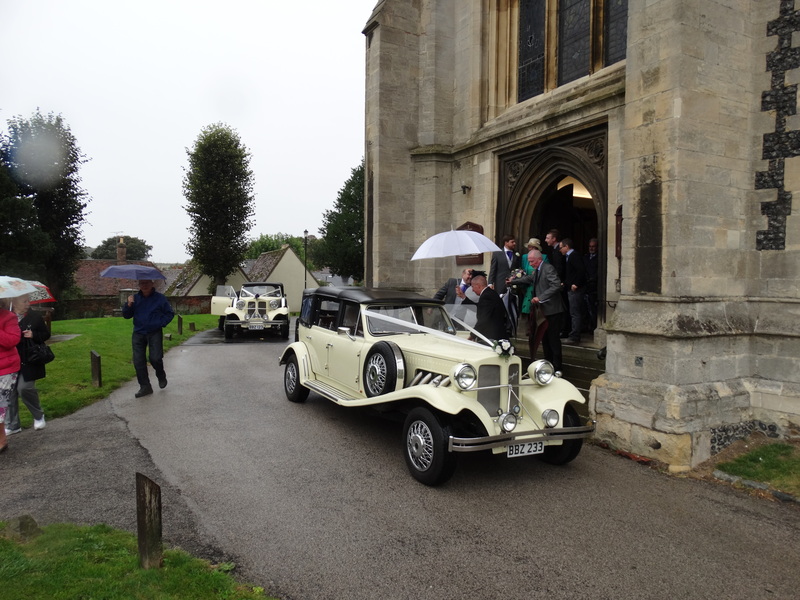 We are back in Essex for the wedding of Siân and Adam. We first got to know her as an RSCM Southern Cathedral Singer with Hannah – any young singers, we highly recommend the RSCM choirs – http://www.rscm.com/ukIreland/choirs.php. Lots of lovely music in this wedding, and I had the privilege of reading a lesson. 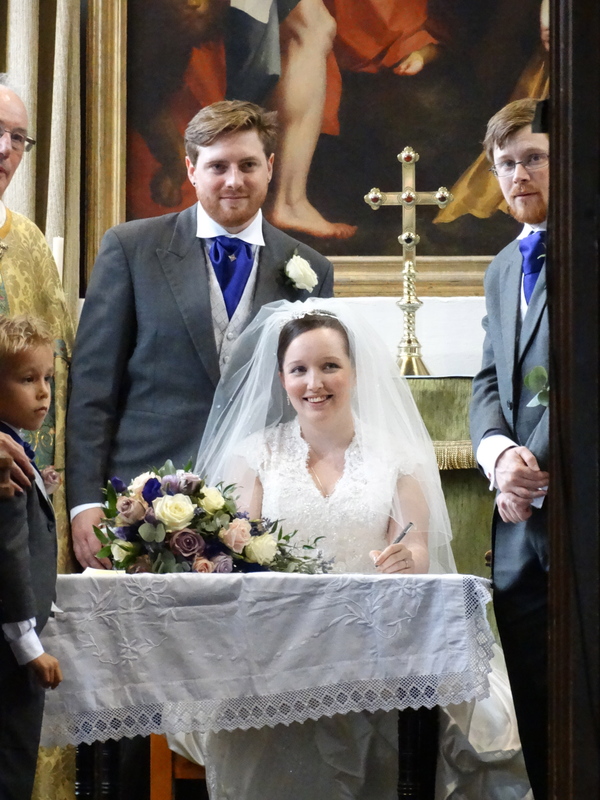 We had been told “no photos during the service”, but we had a view of signing the registers (legally not part of the service!). 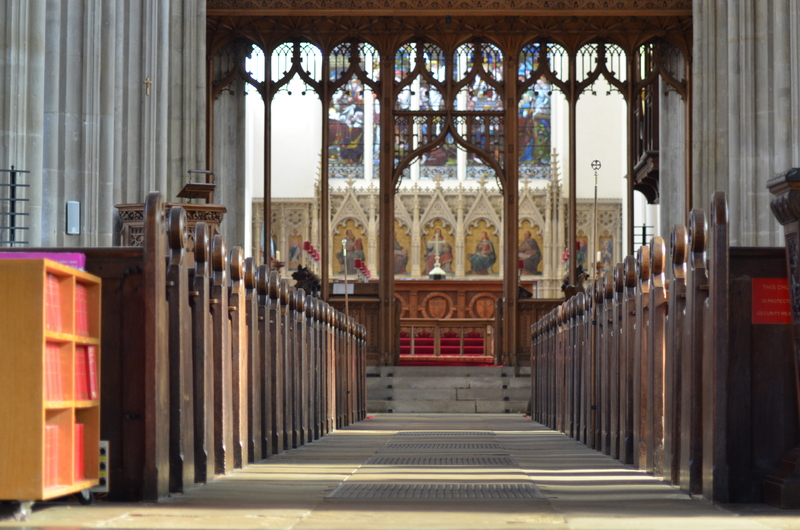 I then had time to photo the church while we waited for things to happen. I also asked Rob (Siân’s dad) if he had any nice photos – those he gave me are credited. You might like to check his blog – http://robthephotographer.wordpress.com. Thanks Rob! The next two are mine, then three of his. 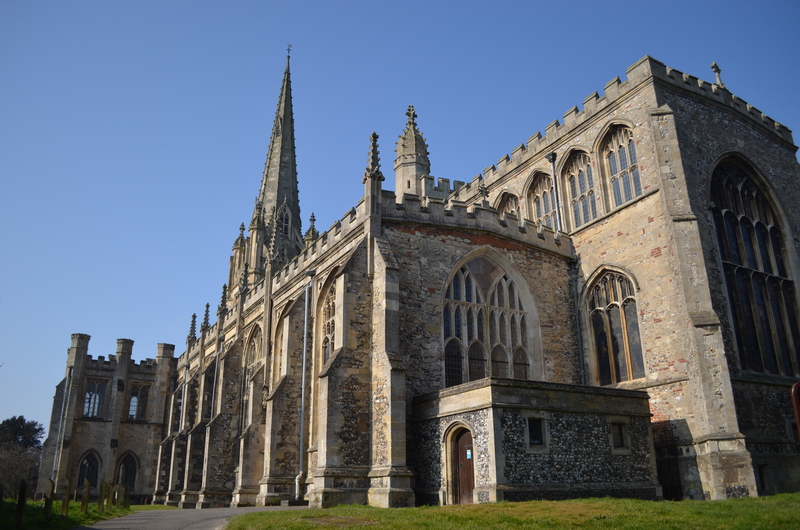 In the west porch is a selection of Bell ringing tablets – they have 12 bells. 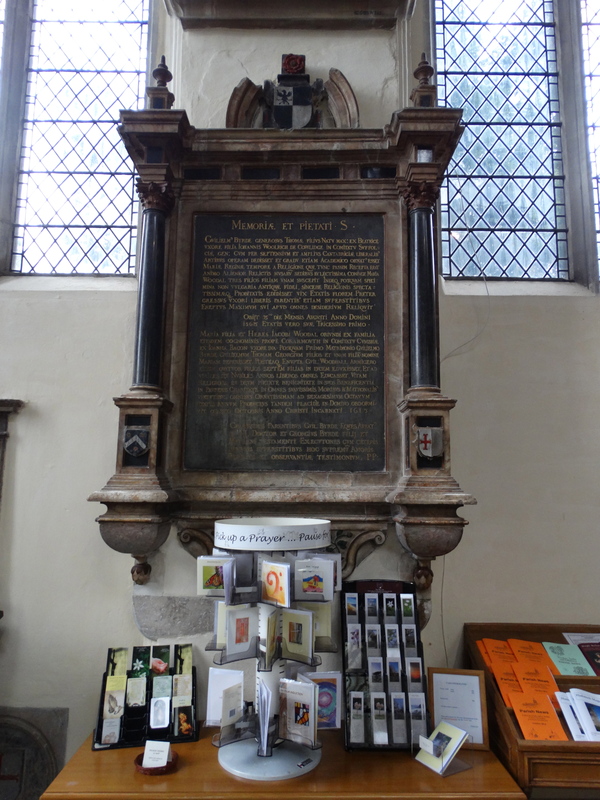 The guidebook says “The last Saturday in June is Great Ringing Day to commemorate Thomas Turner who died in 1623 and who left a bequest in gratitude for having been saved by the sound of the Walden bells when he was lost in a wood”. Memo to self, avoid SW on the last Saturday in June … a “Superlative Surprise Major” sounds fun! 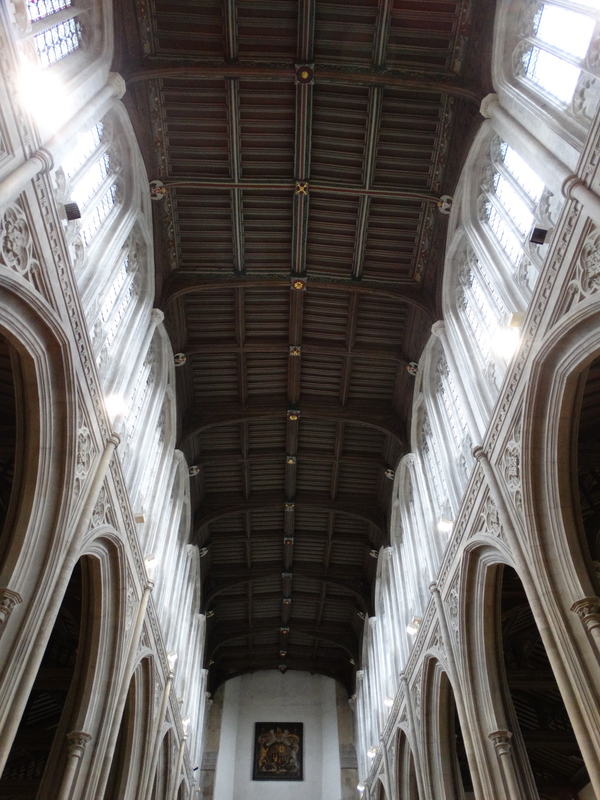 I failed to get a decent photo which shows the 183 feet long, 54 feet high nave. 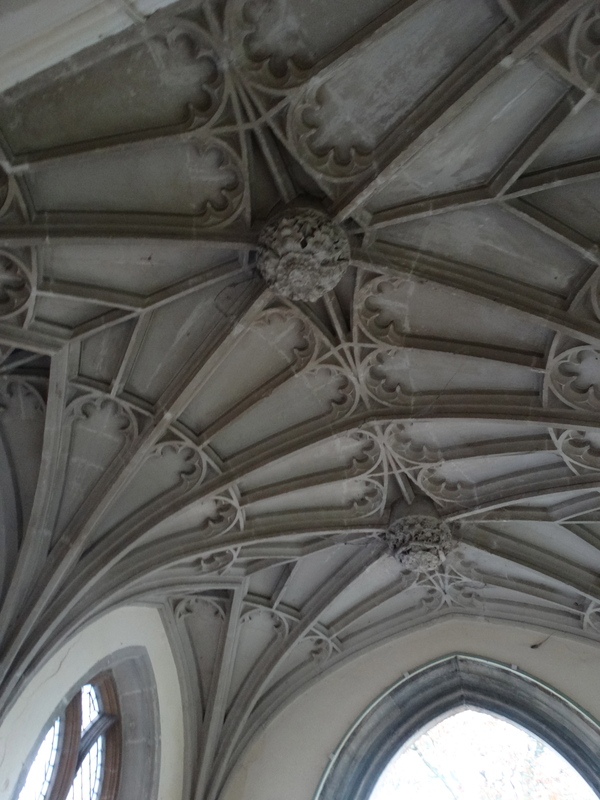 It wasn’t possible either to use the zoom to have a proper look at angels, bosses and corbels. 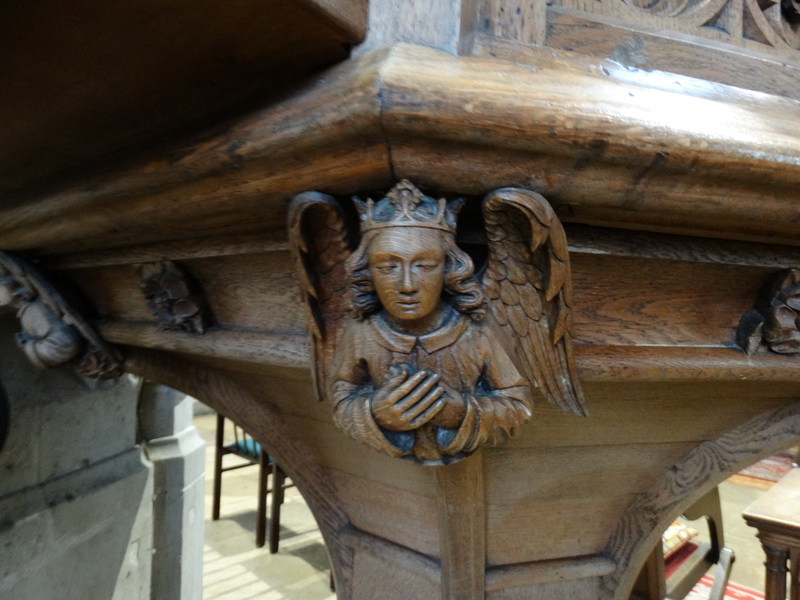 I did get one rather nice angel on the pulpit. 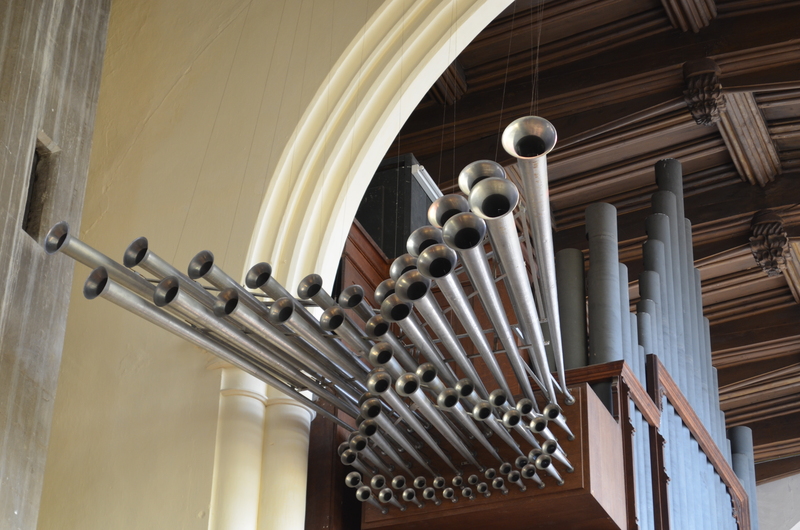 The organ pipes are rather stunning – these are the Trompeta Real (Royal Trumpet). (Rob’s photo). 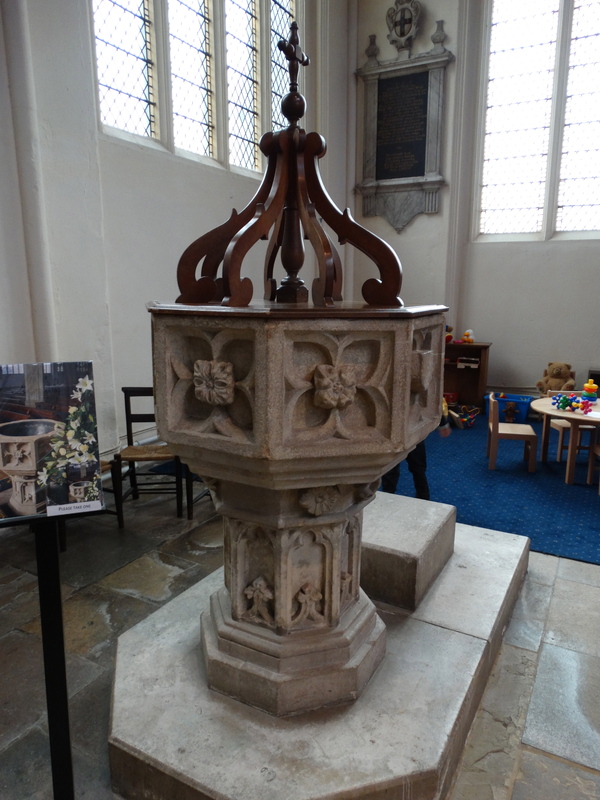 The font is C15, the Banner of the Most Noble Order of the Garter which hangs at the West End belong to Richard Austen, Lord Butler of SW. 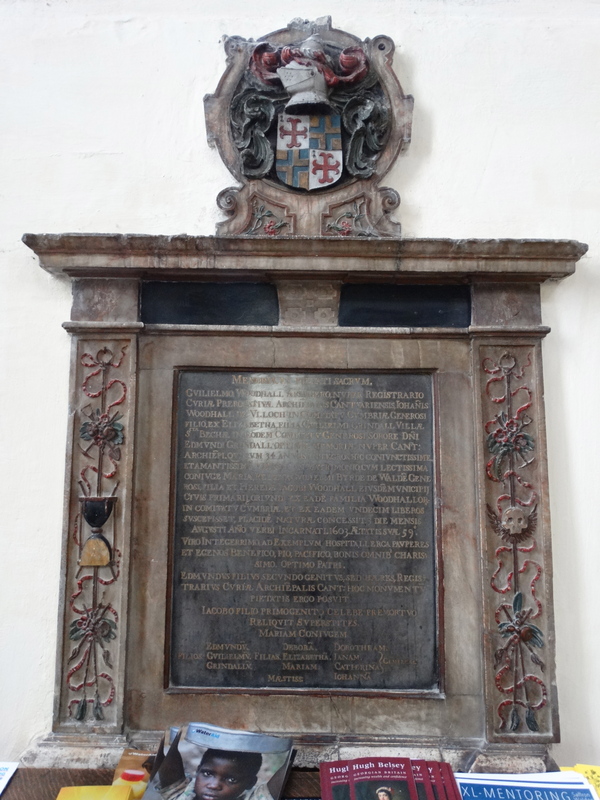 He was the town’s MP for many years and went on to be Master of Trinity College, Cambridge. 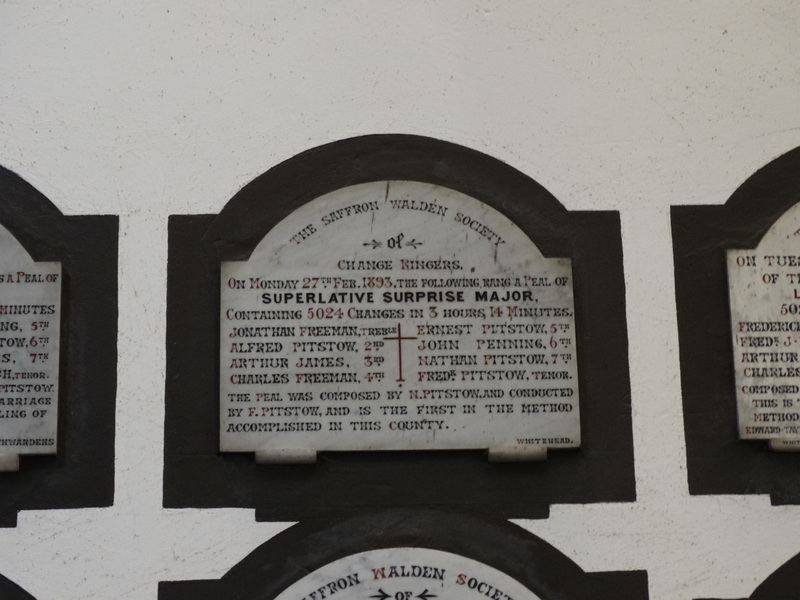 These are two of many other tombs – there are some smashing ones in the church. 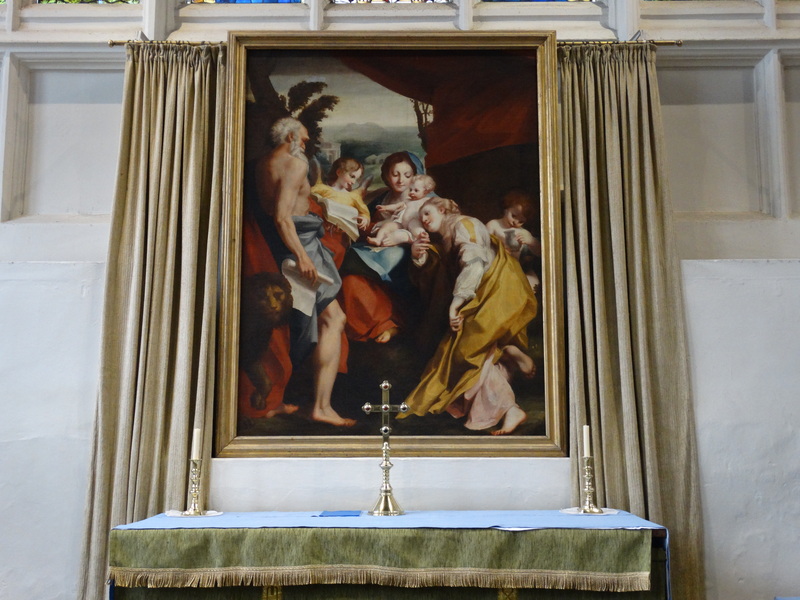 This painting, in the North Chapel, is a copy by Matthew Peters RA of Correggio’s Madonna and Child with St Jerome – the original is in Parma, Jerome made the first translation of the Bible from Greek into Latin – the Vulgate. In this picture an angel points out to Jesus a passage in the book held by the saint in his left hand. In his right he is holding the writings from which he made his translation. Jerome is supposed to have pulled a thorn out of the lion’s paw, hence the lion bottom left. 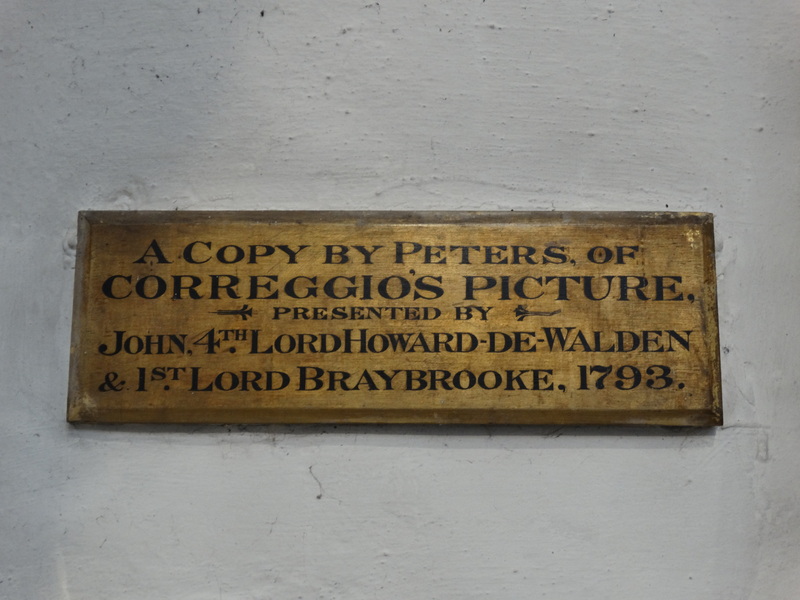 The painting was given by the first Lord Braybrooke (“Thanks so much” said the Vicar) who got his own plaque. 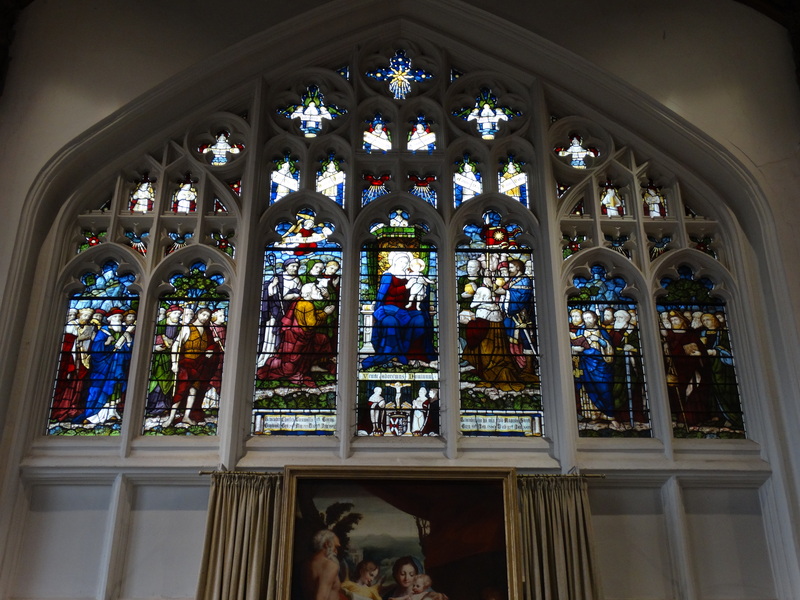 The window above it was made by Burlison and Grylis in 1904, in memory of Charles Cornwallis, 5th Baron Braybrooke and his daughter Augusta Strutt. 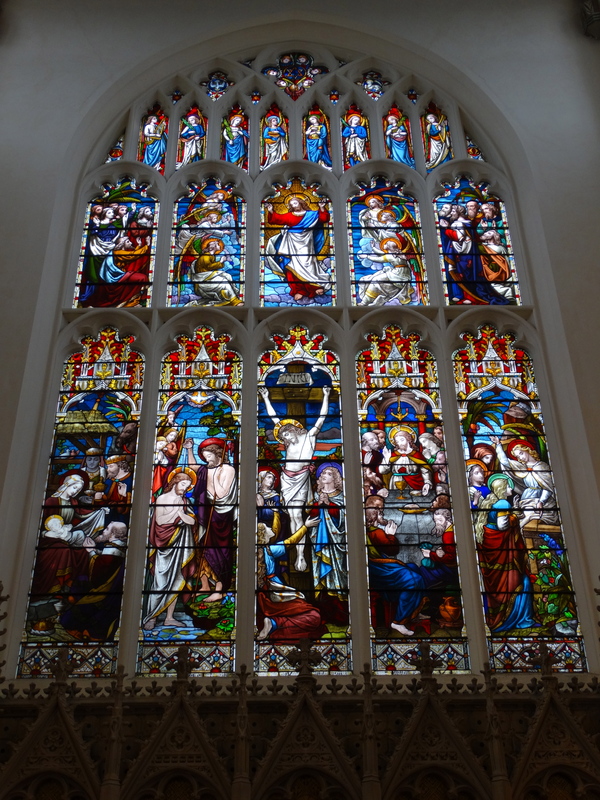 The East Window of the Chancel is by Ward and Hughes, and installed in memory of Eliza Taylor in 1862 in time for Queen Victoria’s Silver Jubilee. 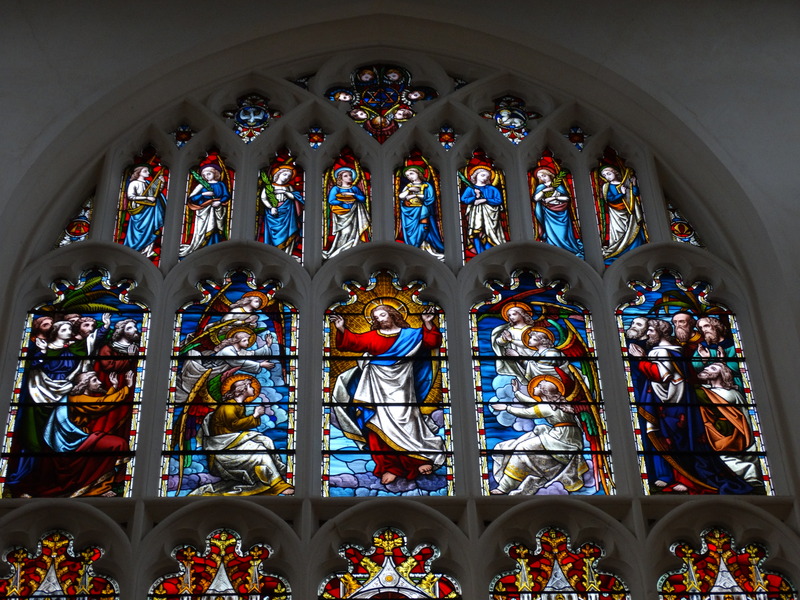 Angels with palms and music (at the top), the ascension (in the middle), the nativity, baptism, crucifixion, last supper and resurrection. 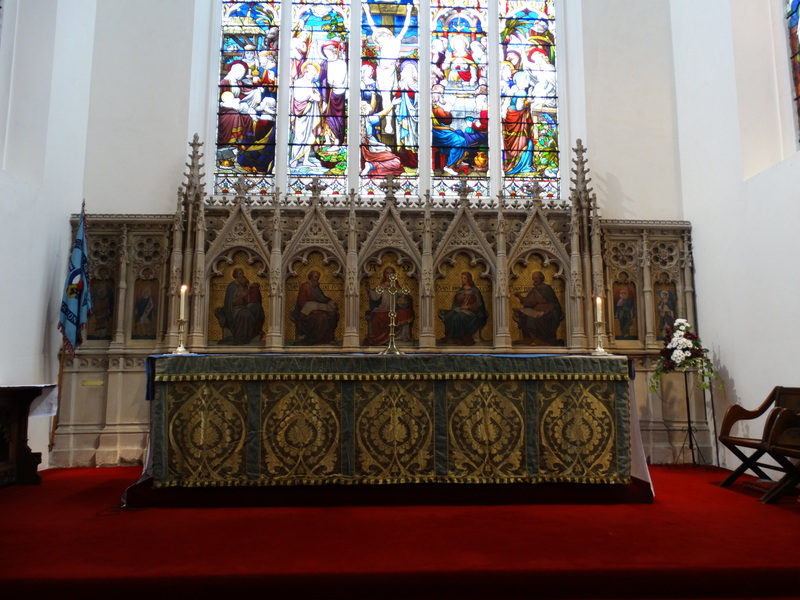 The altar and reredos is 1860. 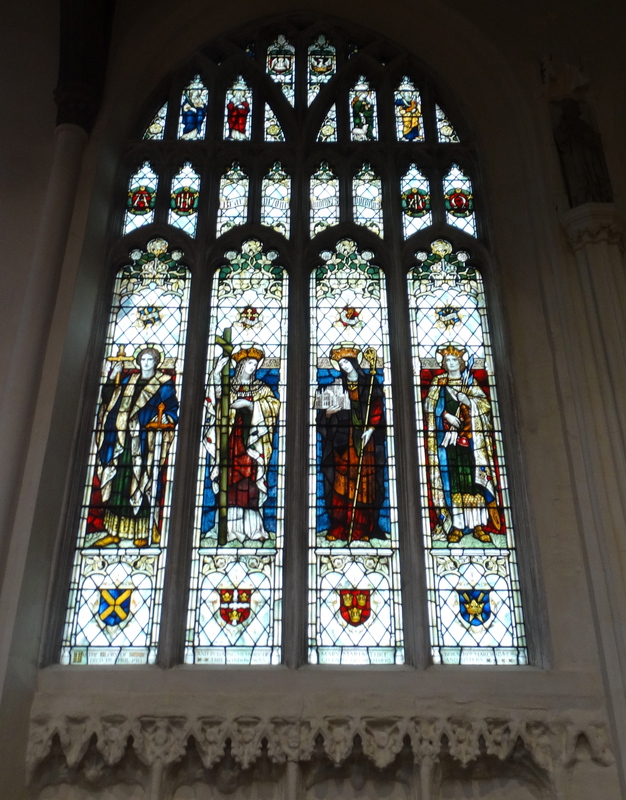 In the North Aisle is this window of East Anglian Saints. 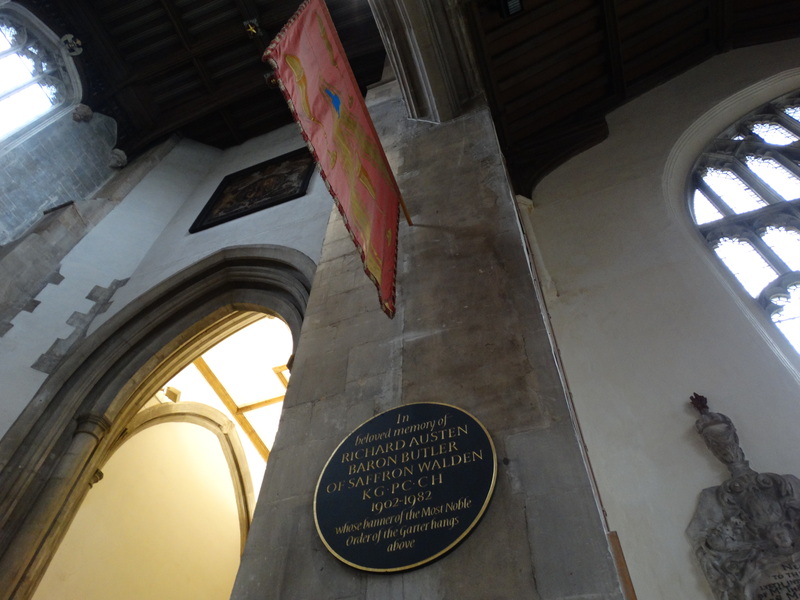 Alban (Roman soldier and martyr), Helena (mother of Constantine, discoverer of the True Cross, daughter of Old King Cole of Colchester – so what proof do we have of that? 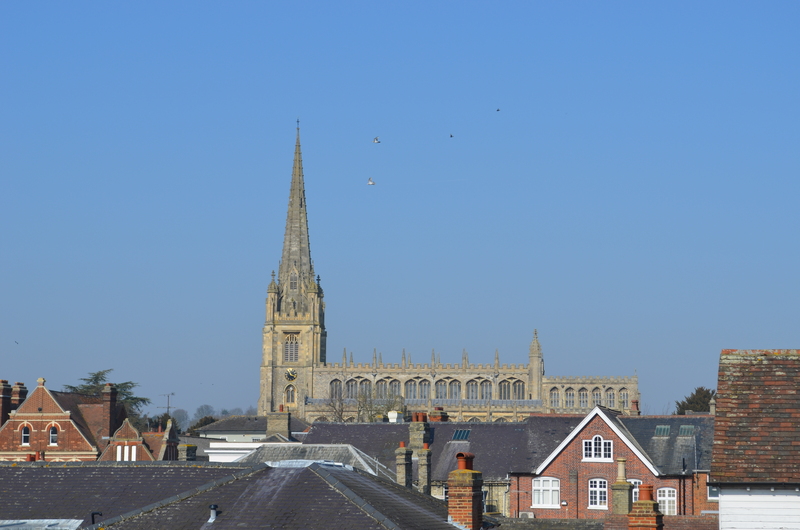 ), Etheldreda (Abbess of Ely), Edmund of you know where. 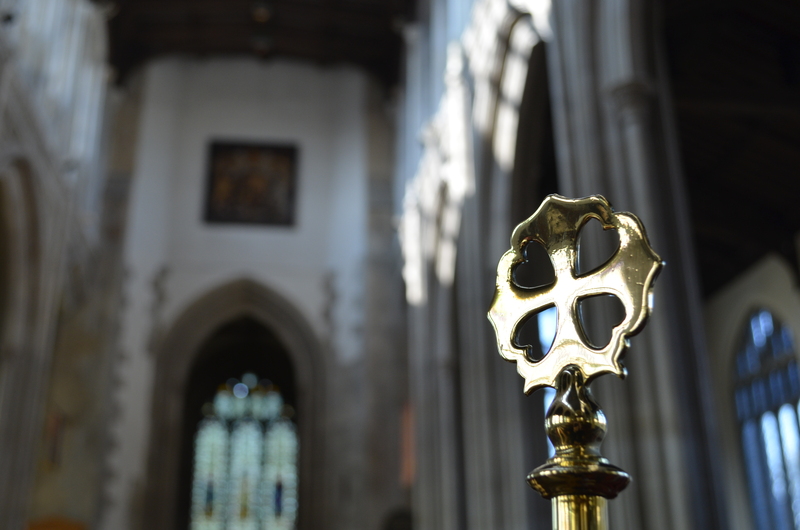 The single head is the oldest piece in the church and may represent Henry VI or (which seems more likely to me) his wife Margaret of Anjou. 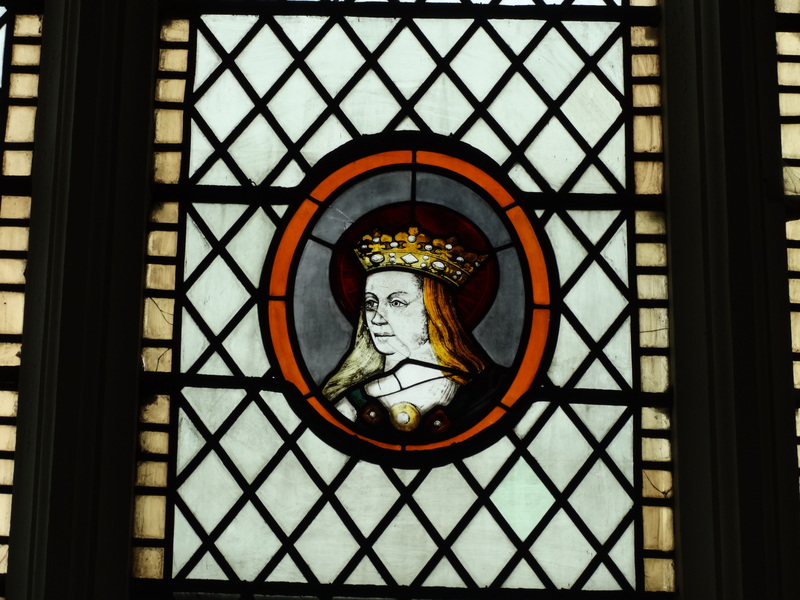 She visited SW in 1452 en route to Norwich. The ringers were fined for not welcoming her with a peal. 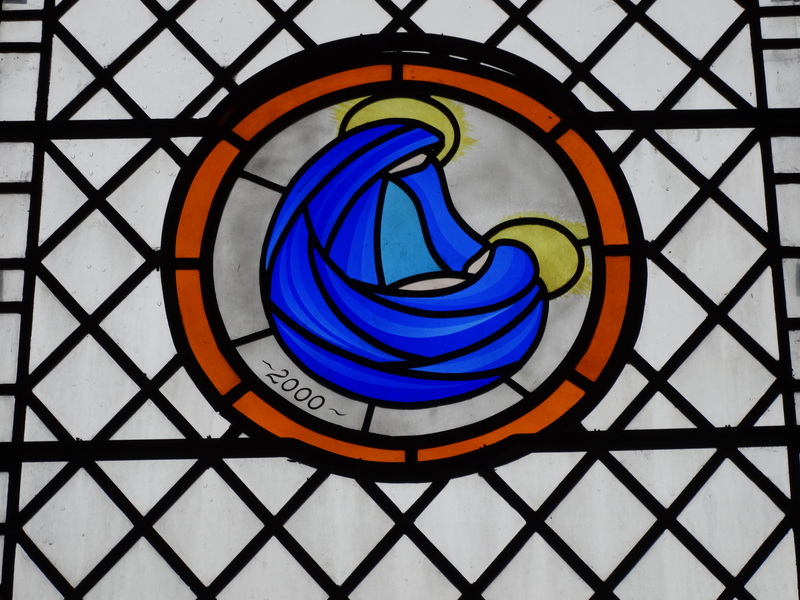 The newest window is this Millennium window, using the design of the Virgin and Child from the Mothers’ Union, glass by Tony Sandles of Sewards End. 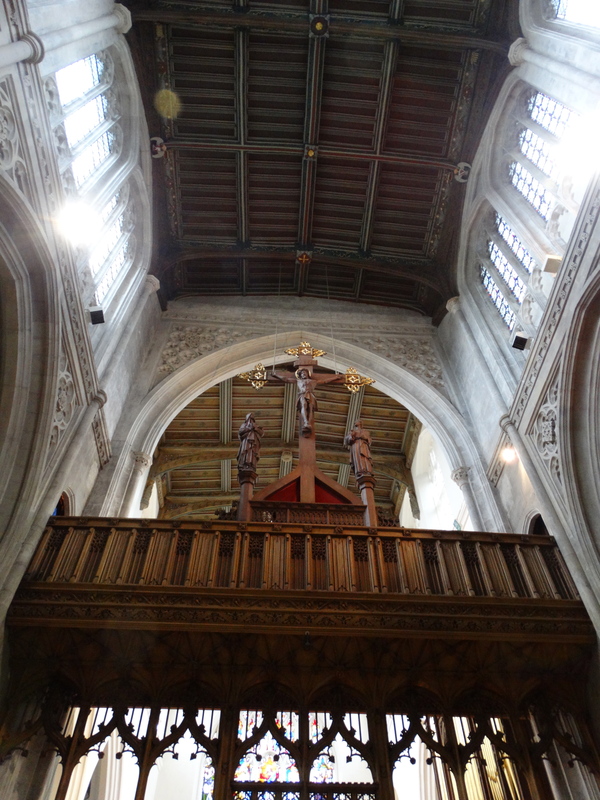 This is just a taster of a beautiful church – but we have a reception to go to! 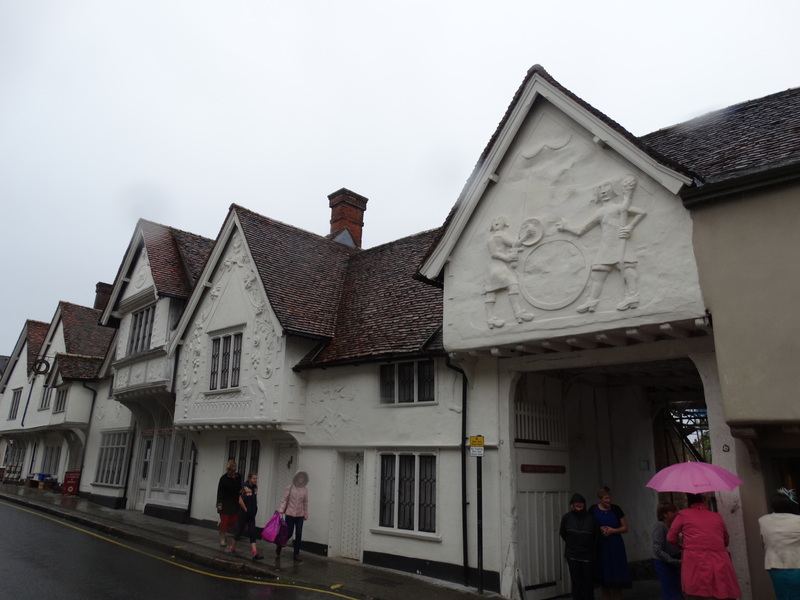 Lovely Essex pargetting on a house across the road. 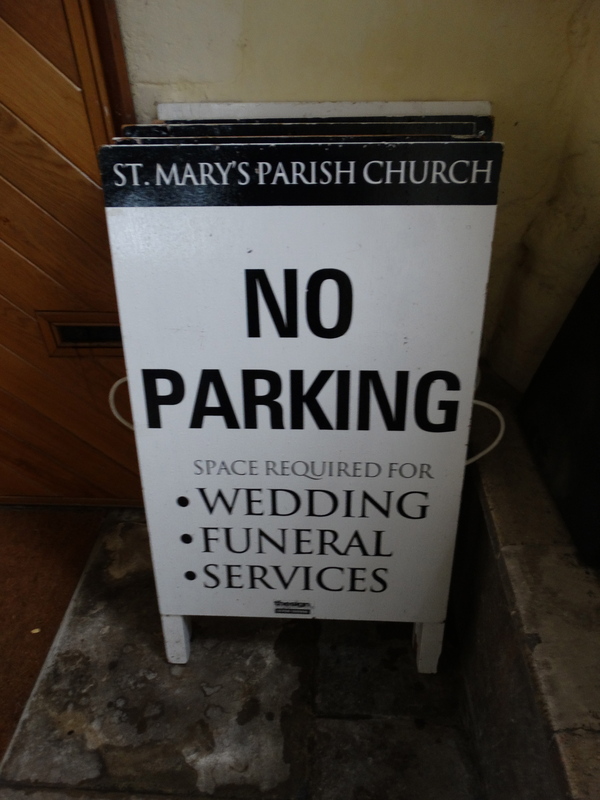 This entry was posted in Outside Northumberland, Personal. Bookmark the permalink. Peter, Thanks for the credits, I’m reading your blog about our church whilst sitting in a hotel room in Dubai. it makes great reading (as do your other blogs of course) Keep up the good work.